First Comics News: Why use a gorilla as a villain? Roy Johnson: Mainly because it’s a throwback to DC Comics’ supposed observation that comic covers in the 60s that featured gorillas sold better. Gorillas are cool. The idea of fusing him with cybernetic parts gave him the name Cyborilla. 1st: What are Cyborilla’s powers or abilities? Roy: Cyborilla’s primary ability is his super-genius intellect. He is skilled in the design and construction of advanced technology, including time-viewers, cybernetic armor, functional flying saucers, etc. His strength is even greater than an ordinary gorilla, due to his cybernetic enhancements. 1st: Why did Cyborilla become a villain? Roy: Cyborilla believes that the world would be a better place with him in charge; particularly over the backward humans he pities. Although his propensity for conquest is antithetical to the freedom of the individual espoused by superheroes, he has no qualms with allying himself with them if it serves his purposes, especially if it prevents another super-villain from conquering the planet in his stead. He has opposed or allied himself with Dreadhelm, Khronocide, and others when it suited him. He is methodical in his plans, always taking the long view. 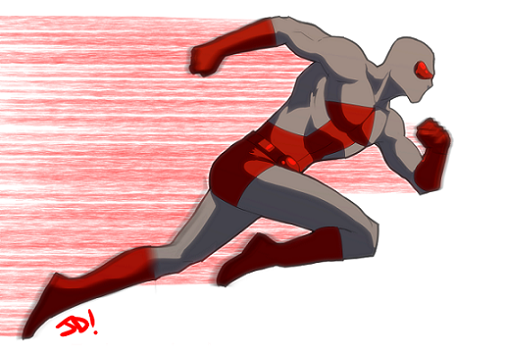 1st: Who is the Crimson Streak and why does he run so fast? Roy: Terry was working as a janitor for Professor Amazo (see Professor Amazo) when he accidentally activated the experimental ‘God-Realm’ portal which successfully created Lady Fairplay (see Lady Fairplay). Somehow the device infused him with the ‘essence of speed’, as Amazo called it. At first, Terry was frightened by his new abilities but he became more comfortable with them and starting operating secretly to help others. 1st: What personality does the Crimson Streak have? Roy: Terry Huang is a young writer, a bit unsure of himself, but eager to learn. 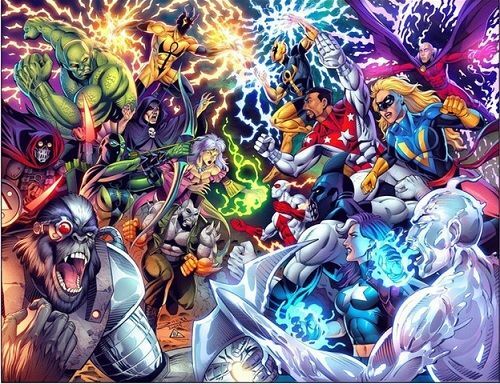 1st: Does Cyborilla resemble Gorilla Grodd or Monsieur Mallah in any way? Roy: Other than being a gorilla supervillain, not really. 1st: Who are the Sentinels? Roy: The Sentinels are a team of the Planet’s Ultimate-Superheros. The Simian Savant, Cyborilla, attacked the United Nations building in New York, in an attempt to take over the world…by due process. At least in his mind, it was. Five heroes responded to the call: Nelvana, who was coincidentally at the UN to plead for fair treatment of the Inuit population of the north; TNT Todd, also there, but in his guise as an FBI agent; Man o’ Metal, investigating a case; Hydroman, who was attending a nearby scientific demonstration with the final member of the team, Magno. The Sentinels formed in response to the threat. With the immediate threat removed, the team decided to continue to operate together (The Sentinels #1). They were the original Sentinels. Later, new members came on board and the originals mostly left (except for TNT Todd). Now led by Optima. 1st: What exactly does Standard Comics do? Roy: Standard Comics was a real publishing company until the mid-late 1950s. When I was commissioning artwork for fake covers featuring public domain heroes, I chose that name (and the flag) as the company. Now I have my own publishing company called Standard Comics. 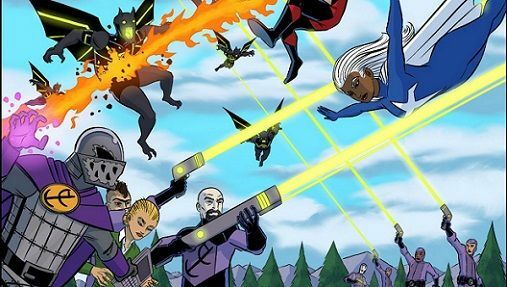 I ran a successful Kickstarter for an issue of the Sentinels, and am reprinting some PD heroes comics while gearing up for the next Kickstarter launch. 1st: What does the future hold for Standard Comics? 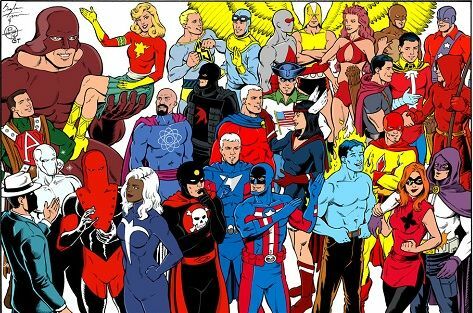 1st: Do you have any more ideas for comic book characters? Roy: Working on a third edition of the “Standard Comic Encyclopedia” that will have about 28 new characters in it. 1st: How does one become a better comic book creator? Roy: Create, don’t just think about doing things, do them. 1st: Would you prefer to have Cyberilla’s or Crimson Streak’s abilities and why? Roy: Crimson Streak to save on gas. 1st: Do you prefer working on villains or heroes and why? Roy: Heroes come more easily, but villains can be more interesting. 1st: Anything to say to the fans of your comic book work?